This work presents PyramidalExplorer, a new tool to interactively explore and reveal the detailed organization of the microanatomy of pyramidal neurons with functionally related models.It consists of a set of functionalities that allow possible regional differences in the pyramidal cell architecture to be interactively discovered by combining quantitative morphological informationabout the structure of the cellwith implemented functional models. The key contribution of this tool is the morpho-functional oriented design that allows the user to navigate within the 3D dataset, filter and perform Content-Based Retrieval operations. 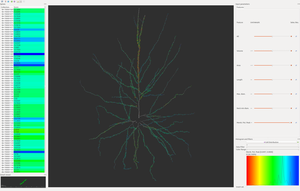 As a case study, we present a human pyramidal neuron with over 9000 dendritic spines in its apical and basal dendritic trees. 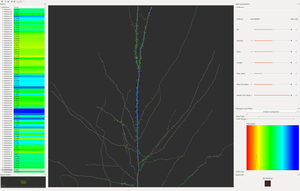 Using PyramidalExplorer, we were able to find unexpected differential morphological attributes of dendritic spines at particular compartments of the neuron, revealing new aspects ofthe morpho-functional organization of the pyramidal neuron. Download and uncompress (or install in Linux) the PyramidalExplorer application. Uncompress the data test set. Open PyramidalExplorer application and load the xml data file located in the uncompressed test data. Note for Windows users: if you get a DLL error please install the package vcredist-msvc13.exe included in the PyramidalExplorer zip. 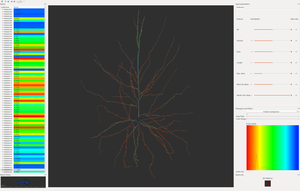 "PyramidalExplorer: A new interactive tool to explore morpho-functional relations of pyramidal neurons". This work has been partially supported by the Spanish Ministry of Economy and Competitiveness (Grants TIN2014-57481 and BFU2013-41533R, and the Cajal Blue Brain Project C080020-09, the Spanish partner of the Blue Brain initiative from EPFL) and by the European Union’s Seventh Framework Programme (FP7/2007-2013) under grant agreement no. 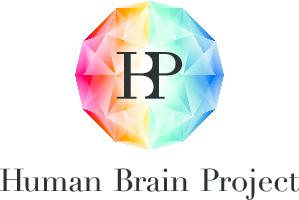 604102 (Human Brain Project). R.B.-P. was supported by the Ministerio de Economia y Competitividad (CSIC).